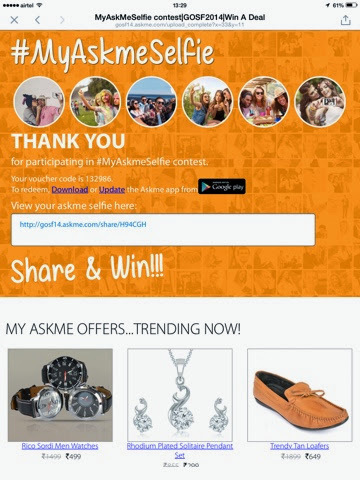 AskMe has joined the great online Shopping festival Gosf14 and running an offer in which you can earn 14 minutes of free shopping gift vouchers of 5000 and assured gifts of ₹250 for all the participants. 14 minutes of free shopping is giving you ₹2,50,000 free limit of shopping. 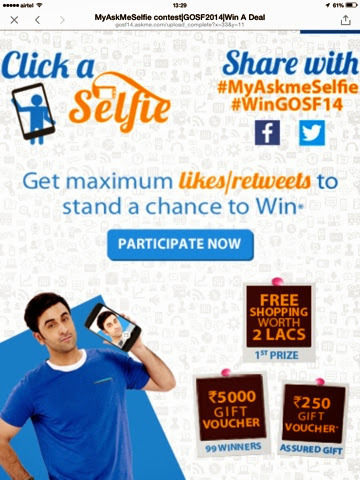 As soon as the selfie gets shared you get the ₹250 voucher code instantly. Use this voucher code on AskMe to buy anything you wanted. Do return to aahafaiz for more deals, coupons and offers.